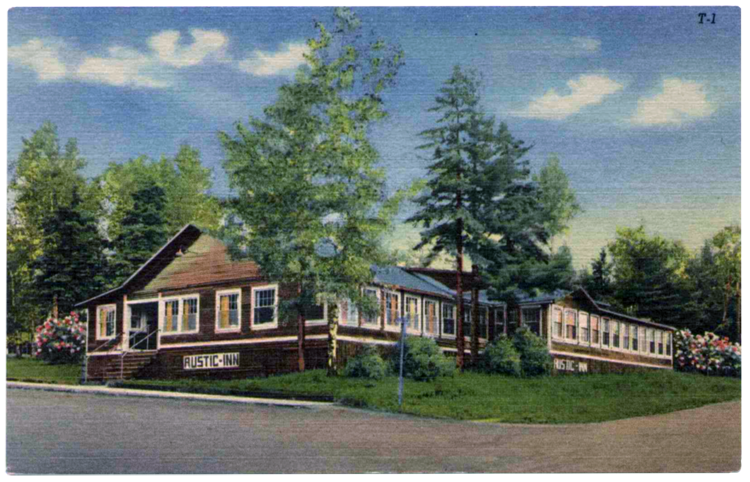 In 1923 Alice and Iver Admundson opened a hamburger stand at the corner of Third Avenue and First Street (also known as Park Road), and it quickly became a Two Harbors institution with a reputation for serving the best food in town, endorsed by famed food critic Duncan Hines. The versatility of the Rustic’s facilities made it the place for everything from card parties to public meetings. In the 1920s, the Duluth Eskimos, one of the first teams in the National Football League, held training camp at the Rustic (the Eskimos eventually became the Washington Redskins). The business was so successful that over the years several additions were made to the original building. Considered one of the first businesses on the North Shore to cater to tourism, the Rustic actually prospered during the Great Depression thanks in part to its role as host to Civilian Conservation Corps camp workers. The owners also took advantage of the North Shore’s reputation as a respite for allergy sufferers in the days before antihistamines: the Amundsons built eleven “Hay Fever” cabins which they rented to those from farming communities seeking relief during the summer. This aspect of the business was so popular they had to hire about twenty high school students during their summer break. The Rustic Inn closed in 1958, driven out by competition from drive-in fast food establishments; the land where it stood is now home to the Harbor Point Apartments. Another Rustic Inn was started just ten miles to the northeast in Castle Danger in the 1920s by a man named Edison, but has no connection to the Two Harbors establishment. The business is still open and the building retains its original logs.